Mersen recently announced the launch of its photovoltaic fuse holder, the certified HP15FHM32 1500VDC HelioProtection® series. Mersen is a global expert in electrical protection and control for electrical power systems, and for this reason the HP15FHM32 fuse holder series was designed in order to comply with global standards. The IP20 ingress protection rate, possible thanks to a finger-safe rotating fuse carrier that accept 10/14 x 85 mm gPV fuses, takes the fuse holder to the next level of safety for utility-scale photovoltaic applications. The body of the fuse holder is engineered with leading UL94-V0 material, providing high flammability rating and very good durability. The fuse holders also include a lock out/tag out feature as well as DMM probe access. The HP15FHM32 series fuse holders are offered in two variations. The HP15FHM32A features a screw clamp, and the HP15FHM32B features a tool-less CAGE CLAMP®. Both are to accept standard PV rated wires with DIN rail mounting, providing added flexibility and versatility for end-use installations. Ferraz Shawmut is now Mersen, expanding the offer of solutions for safe, reliable transmission, distribution, and control of power. 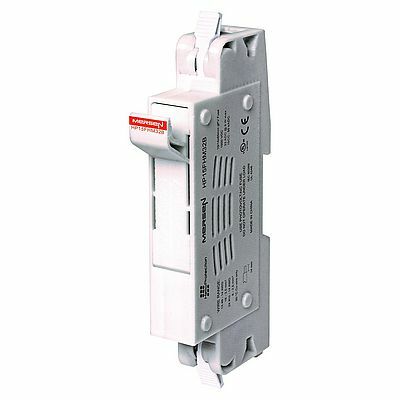 Products include: low and medium voltage fuses, fuse holders, power switches, surge protection, power contactors etc.